I haven't paid a visit to Milani lately. I'm started to feel a little deprived of Milanis. I think they may a new collection out, but I have yet to see it, so we'll visit 2 in their core line. Milani hardly has ever let me down and it's the one brand drugstores I really continue to promote because of their innovation in collection and color selection. Yay Milani! Sun Flash is a medium coral with silvery-pink shimmer with a slight golden duochrome. This is a bright summery shimmer. I spent half of the summer doing cremes, but I think I'm ready for some variation and this is a great shimmer. Sunkissed Glow is on the lighter sight, and unfortunately didn't photograph the way I would of liked it to. It is a peachy-pink shade with silvery-gold-peachy micro-shimmer and again has a slight golden duochrome. It may not look like much, but this truly a beautiful shade. It shows different hints of color and shimmer depending on the light and angle. Short post for today. I figure Sundays tend to be a slower in the blog-o-sphere :P. My boyfriend had a nice birthday. It seems to me that a lot of people share July 31st birthday. Caitlin from Chrysanthemumz whose birthday it was yesterday too informed me July 31st is also Harry Potter's birthday! Speaking of Harry Potter, I really need to visit the new Harry Potter park at Universal. I live about 5 minutes from Universal and I think I've been to Universal Studios twice? Yeah, I should really take advantage of that more often, but I'd rather wait to see the new park when it's not crowded and million degrees :P.
I love Milani; I agree, they rarely let me down. Sunkissed Glow looks so pretty! Also, I'm totally jealous that you live so near Universal! 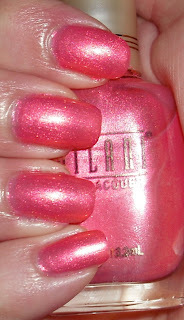 Sun Flash is an interesting color - you don't usually see silver-pink shimmer with coral. Pretty. There's a couple Milani colors I need to pick up - I only have 3 (I think). ooh i'm loving the sunkissed glow! o oh my gosh.. when i was a kid I always wanted to visit that orlando park.. haha jealous.. I still haven't visited disney land in la! I like avoiding places when they're too crowded and hot too. LOL Universal...I'd like to visit some day. Ping- I know, I feel bad when people say they're jealous because I rarely take advantage of living so close. In summer it's out of the question though it's way too hot. Megan- You are right, it is rare to see a coral with a silvery shimmer. You usually see them with gold. Pretty- I prefer Disney over Universal any day! If you're every going to go to one of those theme parks choose Disney! I like how small the Milani brushes are. I don't own many but I really like the ones that I do. Very pretty choices!